The newest trend may be out but my heart still belongs to contoured cheek bones and defining the face and so it's not leaving my makeup routine anytime soon. I've decided to take all the different brushes I use when I contour and put them all together to create this post. Some can give you a defined bold look while others blend out the product to make it acceptable for everyday wear. Hopefully if you're still looking for that perfect brush to help you contour this post may help! Starting with the Eco Tools Face & Body Sculpting. This is a brush I got for my birthday because everyone knows I'm slightly obsessed with the perfect brush for contouring. This is probably the largest brush I own in my collection and I think it definitely would be great for a makeup artist to have in their kit if they do some body sculpting or painting as it's so huge. Now because it is so big when I first got it I was thinking how on earth is this going to contour my face if it's the size of my cheek however I actually really like it especially for when I'm going for a light contoured look. The bristles are extremely soft and pick up just the right amount of product to create a nice subtle look. Zoeva 109 Face Paint Is a brush that I had wanted for the longest time and when I got it I was actually so surprised by how small and thin it was. However this does mean that you can get a nice defined look using this. I absolutely adore using this with my Nars Laguna Bronzer because it's just such the perfect size to create a nice neat line and then to just blend the top half out. Again it picks up just the right amount of product making it easy to work with if you have to layer a product. Zoeva 228 Luxe Crease Now this is a brush I'm obsessed with especially for applying eyeshadow and contouring. However I will only use this if I'm going for a real heavy contour and I use this to contour my nose. As it's small and very fluffy you can create the look you want very easily and because of how fluffy it is it blends the product while you apply it which I find great. Sometimes I find if I use a bigger brush it may cause fall out or even to apply too much product so this brush is perfect! Zoeva 127 Luxe Sheer Cheek This brush is shaped perfectly to fit right into the hollows of your cheeks (or non existing ones) and it creates a really nice subtle contour which is great for an everyday face. The bristles on this though (pretty much like every Zoeva brush) feels like silk and they are just such amazing quality for the money. The last Zoeva one (can you tell I really like Zoeva brushes?) is the Zoeva 110 Face Shape. This one as it's so small is perfect for when you want a real defined contour as it's small enough for you to fit in the hollows of your cheekbones (or non existing ones like me!) This is perfect for giving you a strong bold contour perfect for events or nights out. Finally the Real Techniques Bold Metals 301 Flat Contour which is very similar in shape to the Zoeva Face Paint. However this one is much larger and the bristles are much more tightly packed together. I've heard so many mixed reviews about these brushes but honestly I like it. I do believe you get what you pay for and the quality is amazing plus look at how pretty it is. The brush helps give you a very defined line which you can choose to blend out or leave it as a strong line. 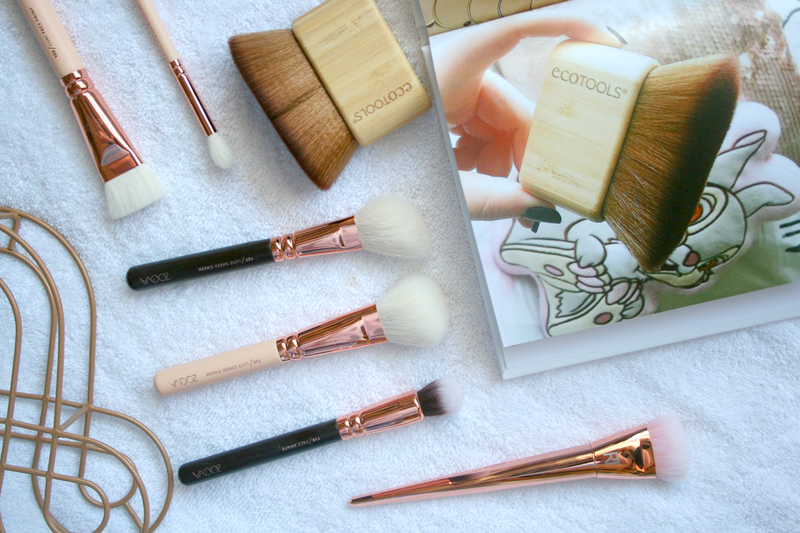 What are your favourite brushes to contour with? I 100% agree with you about the RT brush and I love using it. Zoeva is a brand I really want to try though, I only hear wonderful things about their brushes! I'd never leave out contouring, especially now that it is Autumn. I love using the real techniques brush too, it is really lovely. I have the real techniques contour brush and that's the only contour brush I own right now. But it's really good, especially for cream contouring. I really want to try the Zoeva brushes but can't decide between the pink/rose gold ones or the black/rose gold ones. I'm obsessed with the Real Techniques Flat Contour brush too though. So good. I own this brush from Eco Tools and I must say that it's amazing! I need to try more Zoeva brushes. I have only the ones for eyes but no face ones haha!